Last week, the West Virginia Public Employees Insurance Agency (PEIA) Task Force held its first meeting to address the growing costs of health care coverage for public workers in West Virginia. The growing costs of health care for teachers and other public employees was a central reason why teachers went on strike for nine school days. As we pointed out earlier, teachers and other public employees have seen their PEIA costs grow by almost $1,000 over the last three years while their pay has been stagnant. The state will need on average $50 million in additional funding every year to maintain current benefit levels, according to PEIA. This is largely because PEIA health care costs are expected to grow at an annual rate of 7.5 percent, with the prescription drug costs being the biggest driver of increases at 11.5 percent growth each year. The PEIA Task Force members have been divided into three subcommittees – outreach, coverage and plan, and cost and revenue – and plan to issue a final report on policy recommendations by December 2018. The policy options the task force may consider could include privatization, new tax revenues, changes to the plan structure (e.g. premiums, tiers, co-pays, deductibles), health promotion programs, the share of premiums paid by employers versus employees (currently 80-20), and strategies for reducing prescription drug costs, to name just a few. Over the next 10 months, the PEIA Task Force will likely explore these policy option and many more to reform PEIA. Natural resource extraction and shared prosperity in West Virginia have never gone together. One reason for this is that the state and its people have never adequately benefited from the rich mineral deposits below their feet. One of the most efficient ways to do this is to raise the severance tax on natural resource extraction. While coal production has been declining rapidly, and most likely will continue to decline, shale natural gas extraction has more than quadrupled over the last five years, and will mostly likely continue to grow over the next few decades. Aside from addressing West Virginia’s “resource curse”, raising the natural gas severance tax is sound policy for several other reasons. First, it is a highly exportable tax. This means that a good chunk of the tax does not fall on the residents of West Virginia, but instead on those living outside of West Virginia. This could be people or businesses consuming West Virginia’s natural gas through electricity, heating, transportation, or the products that are made with it, such as plastics. It could also mean that owners of natural gas corporations, whether it is CEOs or stockholders around the world, pay for it out of profits. Conservatively, at least 89 percent of all dry natural gas produced in West Virginia is exported out of state. States (Texas & Minnesota) that have conducted incidence analysis of state severance taxes have find them to be highly exportable. For example, in 2013, Alaska collected over $4 billion in state severance taxes. That’s $7,500 per adult (16 and over) in Alaska. Nobody thinks the people of Alaska pay this each year. And that’s why even conservative groups like the Tax Foundation understand that state severance taxes are shifted to consumers in other states. Aside from being exportable, most scholars and analysts have found the severance tax has little impact on production or jobs in the state where the natural resource is extracted. The prevalent finding is that reductions in the severance tax just reduce tax revenue. A landmark study by Shelby Gerking, who is one of the country’s leading scholars on severance taxes, found that increasing Wyoming’s severance tax – which is one of the highest in the nation – would have only a negligible effect on production while its “main effects” would be additional revenues. A recent study in Utah found similar results, while a Penn State study found that every $100 million in severance tax imposed on oil and natural gas companies would create a “net gain” of more than 1,100 jobs and boost the state’s economy (GDP). One reason severance taxes do not adversely impact production or employment is because it is small factor in a natural gas company’s decision to drill, especially given that the severance tax is written off against federal taxes. The price of natural gas – not to mention other businesses costs (labor, transportation, equipment, etc.) – are a much larger factor when companies look at their return on investment. The current natural gas severance tax rate in West Virginia is 5 percent of its sale price at the well-head (although the effective tax rate is probably closer to 4.5 percent , after credits and other things are included). Approximately 10 percent of natural gas severance tax revenues go to local governments, while the remaining amount goes to the General Revenue Fund and Infrastructure Fund. Raising the natural gas severance tax rate to 7.5 percent from 5 percent would increase revenues by an estimated $86 million in FY 2020. By FY 2023, it would yield an estimated $115 million. 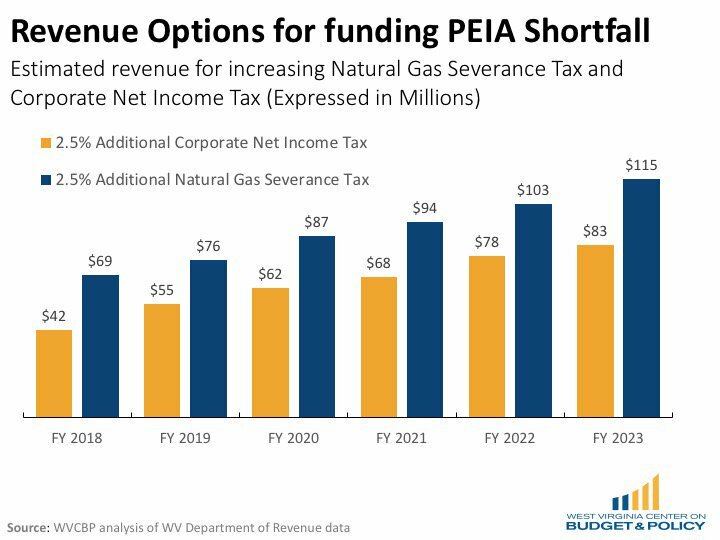 One pitfall of using the natural gas severance tax to fund PEIA is the volatility of the tax. Severance tax estimates are subject to significant revisions over time, so policymakers have to be careful when relying on the revenue it yields each year. To overcome this problem, policymakers can ensure there is a cushion in the amount of revenue projected and needed each year. Much like the severance tax, the corporate net income tax is highly exportable compared to most taxes. The corporate net income tax is a tax on corporate profits that applies mainly to C corporations, while the profits of S corporations (e.g. 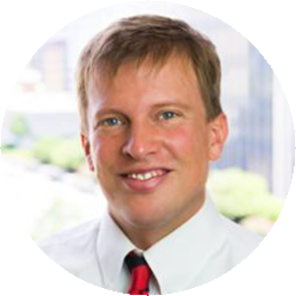 partnerships, LLCs, etc.) are passed on to shareholders and paid on individual income tax returns. The current corporate net income tax rate is 6.5 percent, down from 9 percent in 2006. The rate was phased down 2.5 percentage points over several years as part of former Governor Manchin’s “tax modernization” from 2006 to 2008. Despite promises of more jobs and tax revenues, the state has fewer private sector jobs today than we did over 10 years ago before cutting corporate taxes. This is understandable since most academic research finds that state and local business tax rates do not have much impact on economic performance. It is also important to remember that West Virginia’s implementation of these tax cuts are one of the central reasons why the state can’t “afford” to increase pay and health benefits for public employees. It is also important to keep in minds that business taxes are highly exportable and are only paid by a handful of corporations, many of which reside out of state. Other states have found that most corporations pay nothing in corporate income taxes. Studies in several states have shown that between 41 and 64 percent of corporate income taxes are exported that very little of the tax falls on in-state resident and the little bit that do are higher-income residents. Increasing the Corporate Net Income Tax to 9 percent would provide an estimated $62 million in additional revenues for FY 2020. By 2023, it would increase revenues by an estimated $83 million. While the Corporate Net Income Tax is somewhat volatile, this can be overcome in a similar way as using the natural gas severance tax by using conservative revenue estimates. As the PEIA Task Force continues to meet, it is important that they look at several revenue options and ways to curb prescription drug and medical costs. 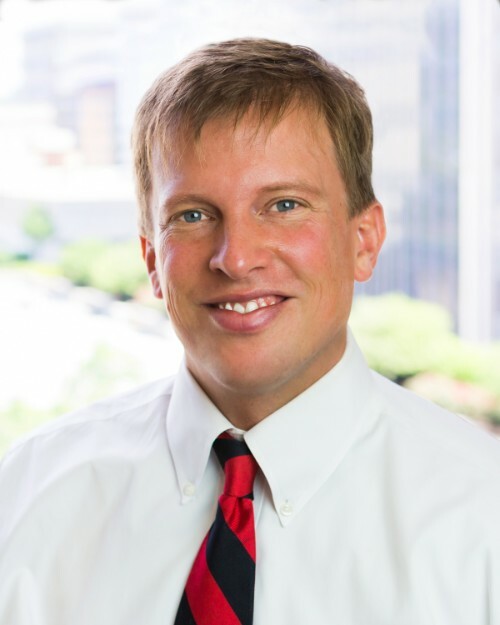 In this post, we explored two revenue options for closing the PEIA revenue gap. Over the next several months, we will also explore other ways to shore up PEIA and ensure that it provides affordable and quality health care to all public employees and members.